So, first things first - I got a reply on my last post from a reader who is actually a writer as well. His blog, Freethinkers Anonymous, both can and should be read **HERE**. He asked if I had read an article that appeared in the LA Times about the hierarchy of complaining. As a matter of fact, I did. I read it when my father was in hospice (or around then - my memory isn't was it was), and it spoke to me in a big way. The premise is that if there is a crisis, the person to whom the crisis is happening can say anything to anyone about it. They always win. Then, the next circle is the spouse/parent/kids, then friends, then acquaintances, then hangers on. 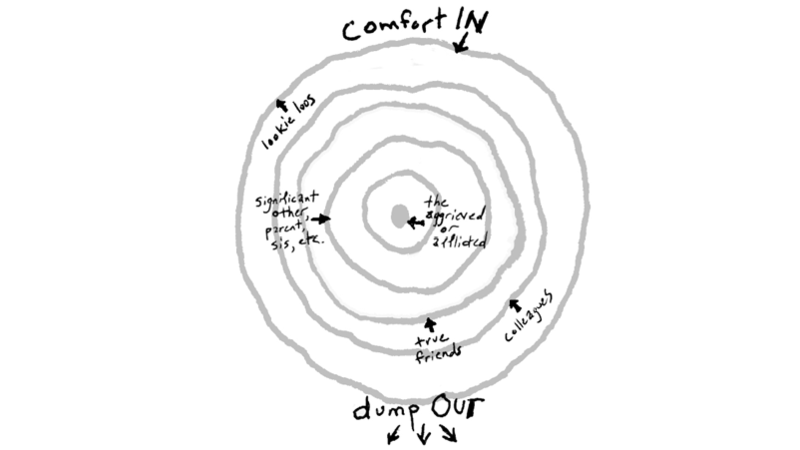 It says that comfort works from the outside in, and complaining goes from the inside out. For example, my mother could complain to me, but not Dad. I could complain to my best friends, and they, in turn, offered comfort. I offered comfort to Mom, she comforted Dad... and so on. It's important to remember to comfort when you're in an outer ring. To put it a different way, there was a humor piece recently on McSweeney's - it read, "Quiz: Janet's Father Has Died. Can You Make This About You?" Honestly, you don't even need to read it - the title says it all. So, I am trying to comfort in as much as possible. Interestingly, today in training, we covered Crisis Calls - this is when a person calls into our support center and their mental state is compromised - threatens to harm self or others. You have to handle these calls carefully. You have to listen, and de-escalate, but you can't promise that you can fix everything. You commiserate. But you never say, "I know exactly what you're facing", because you probably don't. We practiced these calls. I pretended to be a woman who had stolen some of her grandmother's pills and was planning to end it. They talked me down, but I didn't make it easy. Because it's not going to be easy, if it actually happens. It just feels like a theme in my life, and that's kind of interesting. Lest you think, though, that it's all pain and suffering, it is far from. It has been a decent week. I have managed to reduce my sugar intake considerably, though today, there were doughnuts from Dickson Donuts (say it out loud - it's way funnier), and I indulged. I over-indulged, if we're being honest. But! Into each sugary life, some fiber must fall. The past few times I cruised the aisle, I walked past an item, considered the item, and passed it over. Finally, on Saturday, I bought it. The "it" in this case, was a bag of organic red quinoa. I had never cooked quinoa, and I assumed I didn't care for it. Although, to honest, I don't know that I had ever eaten it. But I bought a bag, and Monday night, I decided to make some in the pressure cooker. Guess what! Quinoa is f***ing delicious. We were a family who ate rice. My father always cooked rice, and I didn't much care for it. I craved potatoes. But we were a rice family. Maybe that's why I avoided quinoa. But here's the thing. It is so much better than rice. It's like a really toothy, tasty couscous. It has a great flavor, a wonderful texture, and it's fun to look at. The red quinoa, in particular, is really pretty. My friends tell me you can do breakfast with it. And that sounds fascinating. Better than oatmeal. I also saw a banana apple quinoa cup - kind of a muffin... I think that might be fun. So, yeah. quinoa. Tonight, I had quinoa, some pulled chipotle pork loin, a homemade pineapple pico de gallo and black beans. YUM. I really do enjoy the challenge of making good food. My husband has a cold, and I feel for him. For my part, my nose itches like mad - I'm allergic to something - my guess would be mold, given all the rain and warmish winter weather. Or, it could be dry air and dehydration. Or it could just be in my head. I did notice a flare up when a colleague put on lotion I didn't care for. My injury from the fall a week ago (two weeks?) is healing well. I have one fairly large spot on my elbow that will take longer, but all in all - I'm better. I had my annual review last week, and it was good. I'm still a little spooked by them, but I think I'm overcoming the PTSD. I found some spring clothes I want online. I don't know what size to get, because I don't want to overestimate my success, and I don't want to sell myself short. I also don't want to wait, because these pants are an awesome color and I NEED them. We were supposed to have a meeting today - a tradition within the company called a "Beef and Bravo" - everyone comes up with one complaint, one compliment. And I had no problem with the latter. The former... the best I could do was the fact that our travel policy hems us into making choices that are expensive. I could rent a fabulous Air BnB while I'm in Arkansas for a third of the price of a hotel. And it would have a washer/dryer. And a kitchen. And a yard, which, in theory, would allow me to take Piper with me. I wouldn't, but I could. However, that's verboten per policy. I don't know why. It's ridic. It's not a huge beef, but it's the best I could scrape together. My bravos are numerous. Regardless, they rescheduled the meeting til later in the month. My hope is that I will be in Arkansas. I believe that's about it from here. I am ready for the weekend, and sleep, and laundry. You know, all the things that make America Great (still). Oh, and quinoa experimentation. Lots of playing with quinoa.